Part of the mission of American Kennel Club is to "take whatever actions necessary to protect and assure the continuation of the sport of purebred dogs". In furthering this mission, beginning in the 1930's AKC fostered "children's handling" which in current day verbiage is called Junior Showmanship. 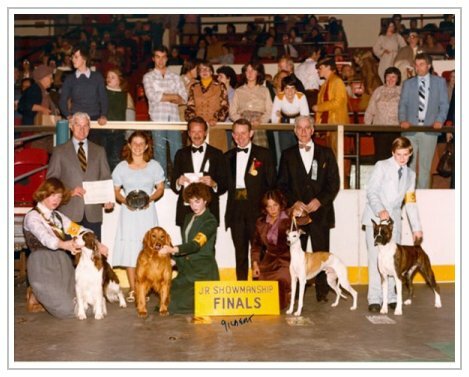 See the AKC History of Junior Handling. To quote the AKC, the concept behind and reason for Junior Showmanship is "to encourage participation in the sport by young purebred dog enthusiasts; to teach good sportsmanship, win or lose; and to educate the next generation of the fancy". In 1954 George Alston won the coveted Leonard Brumby, Sr. Trophy for Top Junior Handler at the Westminster Kennel Club with his Boxer. Since that time many of today's current top Boxer Handlers have won the same coveted honor. No small feat considering that only the top Juniors throughout the country are invited to compete. In 1963 Lydia Ceccarini, Westbury, NY won the coveted Leonard Brumby, Sr. Trophy for Top Junior Handler at the Westminster Kennel Club with her Boxer under Judge Howard Tyler. In 1978 Sondra Peterson, San Diego, CA won Top Junior Handler at the Westminster Kennel Club with her Boxer under Judge Michelle Billings. 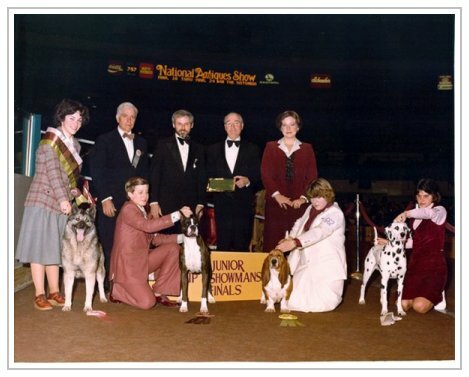 In 1986 Wendy Rene Mattson (better known as Wendy Bettis), Newbury, CA won Top Junior Handler at the Westminster Kennel Club with her Doberman under Judge Howard Atlee. In 1999 Kimberlie Steele, Riverside, CA won Top Junior Handler at the Westminster Kennel Club with her Boxer under Judge Mary Ann Alston. While not every Boxer junior handler has topped the competition at Westminster, many have met the stringent requirements to qualify and to compete. Three past Junior Boxer Handlers, MacKenzie Jones, Brooke Moyer and Madison Rose, have won Best Junior at the American Boxer Club National and qualified for Westminster. While they did not win the Westminster Top Junior award all three have piloted their Boxers to Awards of Merit against the top boxers in the Breed competition. ABC recognizes all the past, present and the next generation of Boxer handlers as the future of the Breed. At the ABC Board of Directors meeting in May 2015, the Board voted to establish a scholarship fund to recognize the Top Winning Boxer Junior Handler each year. Karen Emerson is the Chairman of the Junior Showmanship Committee and welcomes any suggestions and input to further encourage the Boxer handlers of tomorrow.